Dwarf Mexican petunia - sometimes called dwarf ruella - is a hardy little groundcover with cottage-garden appeal that blooms all year in warm, sunny locations. Usually seen with bright violet flowers, this plant is also available with white or pink blossoms. 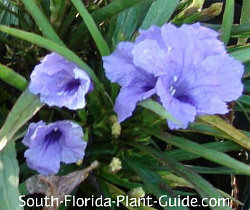 The full size shrub ruella ("Mexican Petunia") is very popular as one of South Florida's prettiest purple flowering plants. But some homeowners fear it will get away from them since it re-seeds and spreads. The dwarf ruella is somewhat more tame. Though it also sends seeds out to sprout in surprising places, the groundcover's wayward seedlings can be mowed over in the lawn, removed from garden beds and sprayed with a herbicide when they spring up from cracks in the sidewalk. 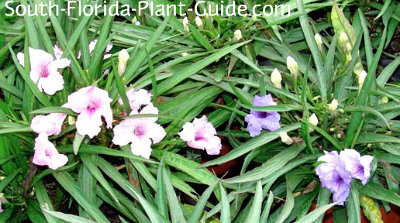 Dwarf Mexican petunia will grow in full sun to partial shade (though you'll get the most flowers in more sun). These plants are cold hardy. In Zone 9B they may die back in winter but usually bounce back in spring. Even in Zone 10, some leaves may turn a reddish color during winter's cold snaps. If you want to plant it with more drought-tolerant things, add Hortasorb® (pre-swelled with water) to the hole when you plant. Place these plants 2 to 2-1/2 feet apart. 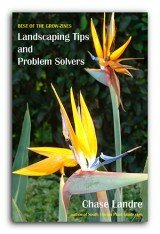 Ditto for spacing among or in front of shrubs. Come in from walks and drives about a foot. COMPANION PLANT SUGGESTIONS: For the purple variety, try dwarf firebush, dwarf yaupon (Schillings) holly, blackberry iris, copper plant, and gold mound.